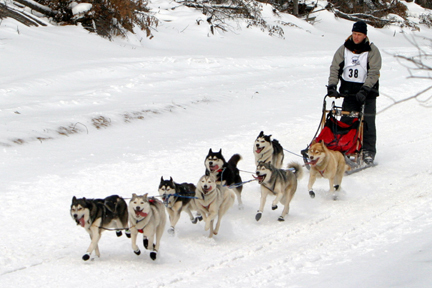 Having seen the East Coast of America and Canada suffer from relative lack of snow in 2005/06 we decided that it would probably be best if we entered a couple of races in the Mid West in 2006/07 just to get our 2006/07 winter off to a good start. Our plans had been to hit the road for three weeks, run the Tahquamenon Country 40 mile race in Michigan the first weekend in January, the White Oak Classic in Minnesota the following weekend before driving back to Vermont to take part in the Craftsbury 60 the third weekend. 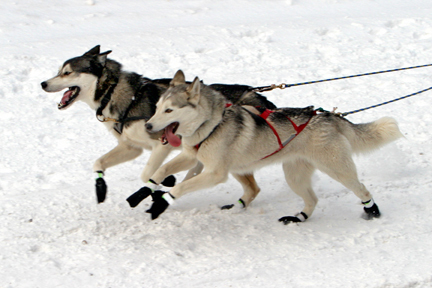 An excellent plan which would not only set the team up nicely for the Can Am 60 in March but would also give us the excuse/opportunity to visit some of the kennels that produce some of our most favourite lines namely Lokiboden, Kraken, Jedeye and Northome. This really was a good plan but once again a plan that failed on first contact with the enemy - the weather. As December progressed and our second Christmas in Canada bore down on us the East Coast of North America was once again bereft of snow. Apart from the one major storm that had hit Nova Scotia at the start of December, about 2 days before we fitted the winter tyres to the vehicles and had left a dumping of snow that remained for about 12 hours, we had had no snow fall at all. The same problem seemed to be affecting everywhere across the continent (except it seemed parts of Alabama and the West Coast). As a consequence of the lack of snow we first heard that the Tahquamenon was being moved to the third weekend in January (and so clashing with Craftsbury) due to lack of snow - we delayed our road trip by a week, frantically trying to rearrange planned visits. Then just as we were about to set off, the White Oak Classic cancelled for the year as there was insufficient snow on the trail. 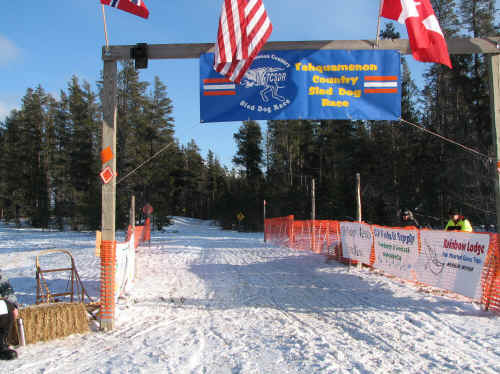 Undaunted, and hearing that the snowmobile trails had just opened in Fort Kent, we set off in search of snow hoping that at least either the rescheduled Tahquamenon or Craftsbury would go ahead and we would get one race in. around Fort Kent we eventually found an access point onto the Heritage Trail at the ski lodge and having quizzed a bemused old timer discovered that we could head out for about 7 1/2 miles on this trail before reaching a road crossing - 15 miles for an initial run would be ideal (I assumed). 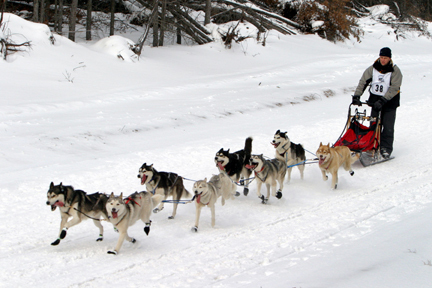 Extremely apprehensive about unleashing the dogs on the sled for the first time this year, and doing so in the centre of an otherwise peaceable town, nonetheless we hooked up 8 dogs, i popped the hook, shut my eyes and off we went. To date all our training had been done on the ATV, lots of miles but really slow, grinding miles. Everyone had told us not to worry though, speed would come once we got on the sled. And so it was with these words ringing in my ears (and drowning out the more sensible whispers of take it slowly at the start so as not to tire the dogs or worse still over exert them) that we rocketed off down the trail. We covered mile after glorious mile, and soon enough the road crossing came into view, we were still going at an average 12 mph - not brilliant but good for us. As we approached the road I stopped the team and called a 'Come Haw' that was then executed perfectly by the dogs. 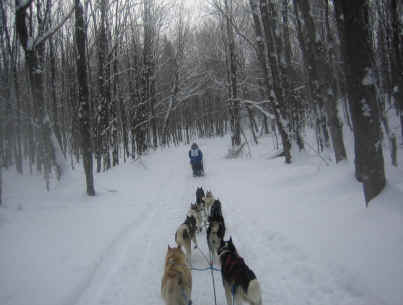 We lined out, all the dogs got a good word, I released the brake and we set off back for the truck. Immediately I noticed something was wrong, the speed wasn't getting above 7 mph and Poppy did not seem to want to lead the team back down the trail. I figured she just didn't want to repeat the trail (I had seen that in her before) and soon she would realise that she had no choice and would pick up again - she didn't. Eventually I decided enough was enough and there must be something wrong with her but as I slowed the team to make a change at lead Poppy seemed to pick up again, so I let her carry on. This pattern repeated itself constantly all the way back and it was a very slow team that returned to the van. I did a physical examination of Poppy, feet, wrists etc., but could find nothing wrong so I put it down to her having an off day and loaded all the dogs back into the van ready for the trip to Toronto and the planned visit to the Lokiboden Kennels. consistent on her Gees and Haws it seemed that now she would not take a single turn straight off; she even came very close to leading the team over a bank/cliff - luckily Paul who was following close behind on an ATV, managed to stop us in time and hauled the dogs back up the bank to safety. 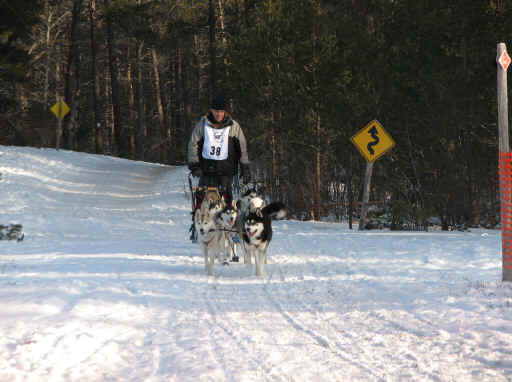 On our second run at Paul's Poppy even did the unthinkable and tried to lead the team back in the direction of the van rather than do the second loop that was proposed by the musher. Enough was enough on the leader front, for the remainder of the training runs I swapped Poppy for Paris and resolved to work with Paris and Medea at lead. dream, leading out nicely and taking every turn on command; this was my 'dream' lead partnership. This being the case you would think I wouldn't consider putting Poppy back at lead for the foreseeable future. Anyway more of that below. match in the fuel tank but then thought that this plan may be a bit drastic as we were about 2500 miles from home. Eventually we got to the Freking's late in the evening, just enough light to view their dogs, far too late to run our guys. So we hung around for a couple of hours and as we were so worried about the van (Manitou Crossing was off the grid and so probably not the ideal place to be messing with a dodgy block heater and battery) we decided to head back towards civilisation and begin the journey back across Minnesota and Wisconsin to Newberry, Michigan and our first race of 2007.
towed out of a snow bank, we were pleased to see that it was snowing, a good sign considering the relatively snow less conditions we had been driving in for the last 48 hours. always ran in the right place and despite lots of training at Boot Camp and at Tara's we were not all that practiced at head on passing. Still, we would be OK (I hoped). As seems to be the norm with me the night before the race was to be a limited sleep night. I quaffed a couple of Blue in the hope that that would send me to sleep and then lay in bed all night listening to the group in the room above us partying until 2am - how I wished I had that luxury.